Defias Ringleader is a 2 Mana Cost Common Rogue Minion card from the Classic set! 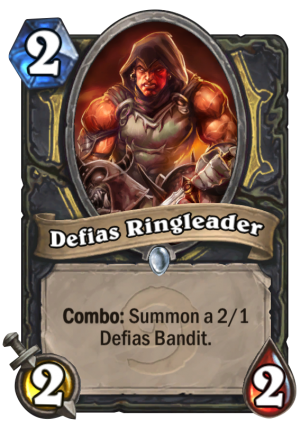 Combo: Summon a 2/1 Defias Bandit. He stole the deed to town years ago, so technically the town is his. He just calls people Scrub to be mean. Rating: 3.7/5. From 107 votes.